The Ink Trap: A New Challenge at Kraftin' Kimmie Stamps: Spooky Sweet! A New Challenge at Kraftin' Kimmie Stamps: Spooky Sweet! 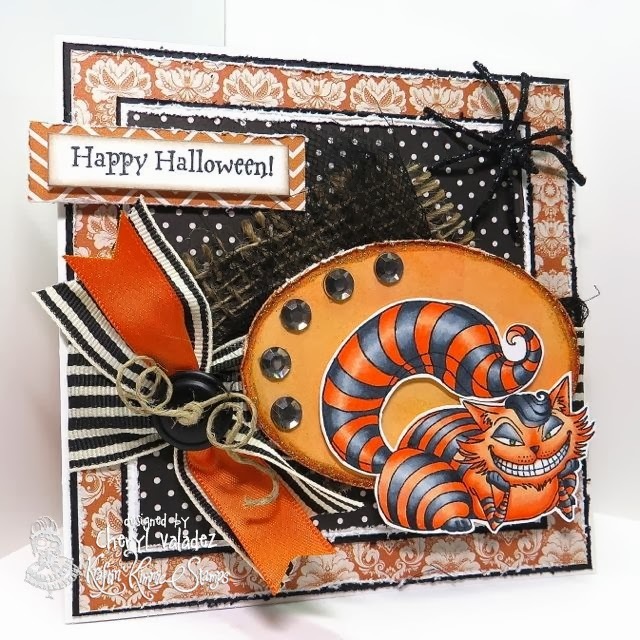 Well, welcome back for another supah fun challenge at Kraftin' Kimmie Stamps!!! This week our hostess is JENNY!! And her challenge is Spooky Sweet!! So create a card, scrapbook page or altered item with a Kraftin' Kimmie stamp that features Halloween or something spooky!! Have some krafty fun and join us this week because we'd LOVE to see your KKS designs. We hope you can play along for your chance to WIN some Kraftin' Kimmie rubbah!!! I've used the Cheshire Cat for my creation. He's one of my favorite KKS images and it's easy to see why. Are you coming to our World Kardmaking Day Krafty Krop??? It starts this morning on the KKStamps Facebook Fan page!!! We've got fun challenges for you every couple of hours starting at 10am EST....lots of chit chat with the Krafty Girls.....krafty fun and PRIZES!!! You'll have almost a week to upload your submissions but a bunch of us are hangin' out and gettin' krafty together TODAY!!! Come join us!! Happy Fourth Birthday to Kraftin' Kimmie Stamps!! To help you celebrate, Kimmie has put a BUNCH of stamps on SALE for her favourite krafty peeps.....yes, that's YOU!!! There are over 125 stamps and stamp sets on SPECIAL 20-50% OFF for this weekend only!! PLUS so many of you have requested to see some of the RETIRED stamps back in the shop, so guess what?! There just *might* be some in the shop this morning BUT there are very limited quantities....so if you want it, scoop it up before it's gone!!! We are thrilled to welcome FOUR new Krafty Guests for the month of October so be sure to say hello and show their creations some love!! Welcome to Alexis, Dana, Kadie and Natalie!! Check out the wonderful creations by our Krafty Girls and Guests featuring this week's challenge!! If you join us and play along, you could WIN a Kraftin' Kimmie Stamp!!! Hey hey Cheryl. That cat looks like he's up to no good with that devilish grin! Lol. Supah card chickie! Love that evil cat all dressed up in his Halloween suit!! Great card Cheryl! !